Maggie Johnson has been gifted with “the Sight” ever since she was a child. Her dreams bring her visions of the future and of a presence she knows is not a figment of her imagination. She calls him Wolf, having watched him grow from a careless young boy into a fearsome warrior, and she trusts him with her life and her heart. Andrew MacDonnell is fascinated by the woman who has visited him in his dreams for as long as he can remember, entranced by her beauty, knowing deep in his soul that she is as real as he. Although he doesn’t know who she is, Andrew believes that destiny will bring them together. What would you do if you had the ability to take a glimpse at another person’s life, someone who you’ve never know and that person lives thousands of miles away. Maggie has never been ordinary; she has always had the gift to see events before they have occurred. She feels connected to Andrew, a man who she’s never met and who frequently appears in her visions and dreams since she was a little girl. But Maggie isn’t the only one who has this remarkable ability; Andrew can take a glimpse into Maggie’s life as well. Tragedy strikes with the death of her father, and Maggie is in desperate need of Andrew’s help. Will Andrew travel thousands of miles away to rescue someone he has never met? My favorite element of Under The Same Sky was the paranormal edition to the novel. 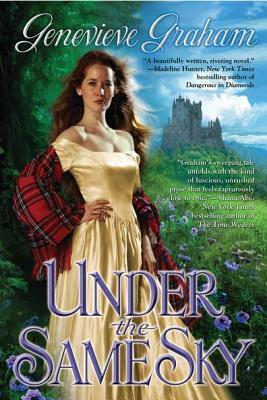 I have recently become intrigued with historical romance novels and Under The Same Sky was no exception. I definitely appreciate the paranormal elements Genevieve Graham incorporated into the story as it is my favorite genre. The plot was captivating and the characters had emotional depth. I also enjoyed getting to know both characters’ background, and could clearly imagine the two much different worlds they each seem to live in. Under The Same Sky is a remarkable debut by Genevieve Graham. There is much more than meets the eye of this historical romance novel. Genevieve Graham has created a unique spin on the “although thousands of miles apart, love prevails all” cliche. With a hint of paranormal elements in addition to the large dose of romance, readers are sure to enjoy this incredible tale. I thoroughly enjoyed this novel, and I would definitely recommend Under The Same Sky to anyone who enjoys Historical Fiction and Paranormal titles.